It was a sunny sunday. I had just finished my worst exam in history. Lots of cake and icecream would have made me feel better but the amount of weight I have gained in the past month won’t let my guilty conscience rest so uber ride to the lastest fruit-centric store in town! One waffle today won’t add the kilos but just to be safe, I went with my least favorite flavor….chocolate waffle….in my head, a few forkfuls and I would abandon the rest then some sugarcane juice to refresh my palate! You want to know how that went? See next picture…. First magic must be the fact that the waffles were not chocolate-overpowered. Second magic, the choice of fruit slices (apples and strawberries which aren’t exactly sweet) had their way of cutting through the sweetness of the waffles. A mix of sugarcane, lemon and ginger. What could be better? And the interesting part is watching them juice the sugarcane…. Actually they have an open kitchen so you watch them prepare everything from scratch. I had called H-Baby earlier and we were supposed to meet up here, not sure why she was late but she was just strolling in as I was dropping my juice mug. She ordered a chicken toast and sugarcane juice to go because….Ramadan Fasting. I got them to plate it first though so I could take a picture for you guys, you’re welcome! Just as we were leaving, H-Baby saw Emmanuella from Wofaifada’s funny skits on Instagram. We walked up to her to say hi and tell her we really liked their videos and she informed us that Wofai was upstairs at Tilt Terrace. Oooo yes, Fruitizz is located at Aarons Mall Lekki, the same building that houses Tilt Terrace, a rooftop lounge. Of course, we went to say hi. This place forever gives me calming vibes. Wofai was in the kitchen which was confusing to me but we decided to wait. Got H-Baby to pose by the famous flower-pot-wall. A few minutes later, Wofai came over and was extremely pleasant to us. It was like we had all known eachother before. That’s Wofai! Notice the prints on her tshirt? Okay, here’s the gist…she makes the most delicious homemade Afang soup (Nigerian delicacy) and gets it delivered to you! Apparently, Just Afang hosts a cook out here on saturdays. Of course I had to have a plate…. The richness of this soup! You just have to try it out and let me know what you think. One plate to go for H-Baby! 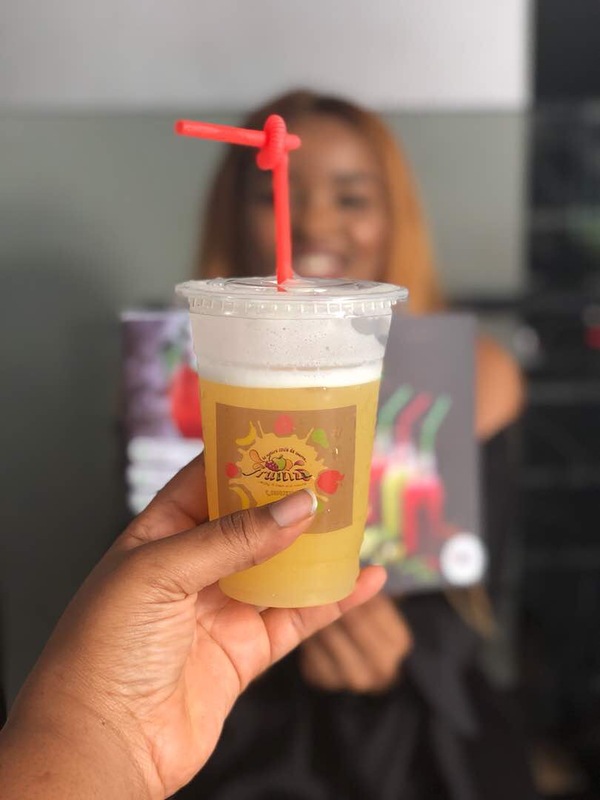 Emmanuella and Wofai both needed a break from all the cook out prep so H-Baby suggested that they escape to Fruitizz for a break. And yes, we went with them. Churros for Emmanuella! Sausage on a waffle stick for Wofai! By now, there was no atom of space in my tummy so no, I didn’t try these but the previous week, I attended the opening of Fruitizz with F-Baby, Uzzy and Munz (My photographer for the day, thanks baby) where we had mini bites of their nutella crepes, churros and sausage waffles. All delish! We also tried out some juices and fruits on a stick…. Fresh Watermelon! Do not forget to like this post and share with fellow food lovers! Lovely write up. Keep this up. I look forward to your posts. Very interesting and fun.